Clearlite Bathrooms are a 100% New Zealand owned and operated company that has been providing a wide variety of bathroomware to suit the style needs and budgets of all Kiwis for over 40 years. If you are building or renovating a bathroom, Clearlite Bathrooms should be your first port of call. But how do you ensure your bathroom stays looking its best for longer? The answer is the innovative, globally patented, number one glass cleaning product on the market — Diamond Fusion™ easyCLEAN. We all want to ensure our shower glass remains clean, clear, and streak-free — the last thing you want is to have your new shower glass sporting mineral stains and mould after a few months. Protect your new Clearlite shower and treat your new shower glass with Diamond Fusion™ easyCLEAN before it leaves the factory. By opting to treat your new Clearlite shower with Diamond Fusion™ easyCLEAN before it is installed in your bathroom, you will not have to worry about arranging the application after your bathroom is finished. We highly recommend you treat your shower glass with Diamond Fusion™ at the factory to ensure your glass is coated and protected before it is used. Now that your Clearlite shower is protected with the innovative Diamond Fusion™ solution, your shower cleaning times can be reduced by up to 90%! You will still need to maintain your glass surfaces, but they will not require a thorough clean like you would have to do if the glass wasn’t treated. Diamond Fusion™ takes the difficulty, out of achieving clean, clear, streak-free shower glass! No more weekends spent scrubbing and scouring your shower, just wipe it with a cloth or a squeegee. Looking for the best way to clean shower glass? Diamond Fusion™ is the answer. Contact us on 0800 66 72 78 or enquire online and our friendly team will get back to you shortly. Why is Diamond Fusion™ The World’s #1 Glass Cleaning Product? Diamond Fusion™ easyCLEAN is a globally patented product that does not use harsh chemicals — just innovative and advanced nanotechnology. This nanotechnology is the secret to Diamond Fusion’s™ success — it makes water bead right off the surface, leaving it no time to sit and stain the glass. Diamond Fusion™ NZ also has the world’s best contact angle at 101 degrees. A higher contact angle results in surfaces being more water repellent as the water has less opportunity to stick — meaning less cleaning time and maintenance! We also have the world’s best sliding angle at 13.1 degrees! A lower sliding angle means a greater amount of ‘surface slipperiness’, improving cleanability and clarity. We stand by our product. Diamond Fusion™ NZ comes with a factory-backed warranty, giving you total peace of mind. Now that your beautiful new Clearlite Bathroom is finished, protect what you have worked so hard to create with a Diamond Fusion™ easyCLEAN treatment on your shower glass. Does Your Current Shower Need Rescuing? If you are have a pre-installed shower that is in need of cleaning to remove its heavily stained glass, contact the Diamond Fusion™ easyClean Glass Rescue team! Restore your mineral stained surfaces and get them looking like new again. From old and stained to clean and clear, our Glass Rescue team can restore your mineral stained surfaces and return them to looking great again — saving you money on replacement costs, and the environment! At Diamond Fusion™ we use a variety of safe mineral stain removers to strip away unsightly build up that all other products just can't remove. Diamond Fusion™ is a safe, eco-friendly and cost-effective solution that can do all the hard work for you! Once the shower glass has been treated and restored to its sparkling former glory, your glass can be kept clean and clear with minimal effort. Contact Diamond Fusion™ today on 0800 66 72 78 to book a qualified glass technician to restore your stained glass surfaces. What to know more about he incredible Diamond Fusions™ NZ brand? Read our FAQs here. Backed by a factory warranty, and applied by experienced glass technicians, Diamond Fusion™ is the best way to clean shower glass — and keep it clean. Reclaim your weekends and reduce your shower glass cleaning times by up to 90%! Restore your old stained glass and save money with a glass rescue treatment from Diamond Fusion. Contact us today on 0800 66 72 78 to book a Diamond Fusion™ technician. 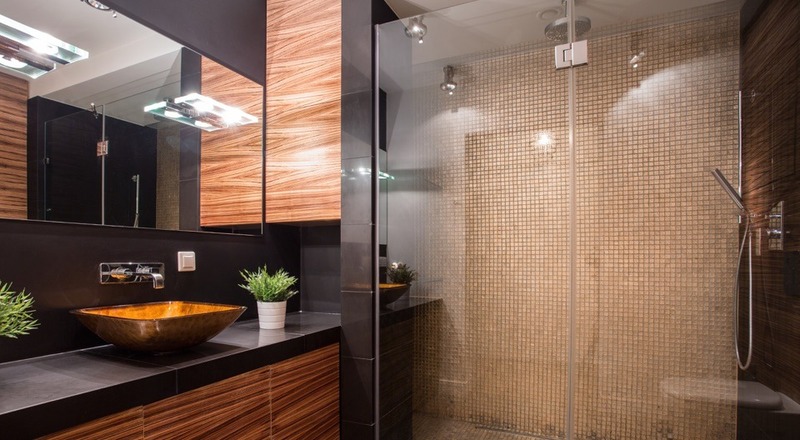 Renovating or redesigning your new bathroom? Diamond Fusion™ NZ recommends Clearlite Bathrooms for all your bathroomware products. Clearlite Bathrooms are a 100% New Zealand owned and operated company that supplies a wide variety of quality bathroom fittings to suit all styles.